or go to Organization > Exchange > Storage Usage. 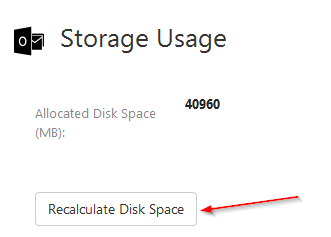 You will see Allocated Disk Space in Mb. You can recalculate the space, but it might take some time. To do so, click Recalculate Disc Space and confirm the action. You will see the new result.